With respect to Naming Contests, we have a standard process in place to support creatives if one of the names they submit is registered while a contest is active, or shortly thereafter. Upon receiving a report of domain registration, we will follow the process outlined in this article. Please note: Our communication policy states that you cannot discuss such issues directly with the Contest Holder. You must report these issues to Squadhelp for investigation. 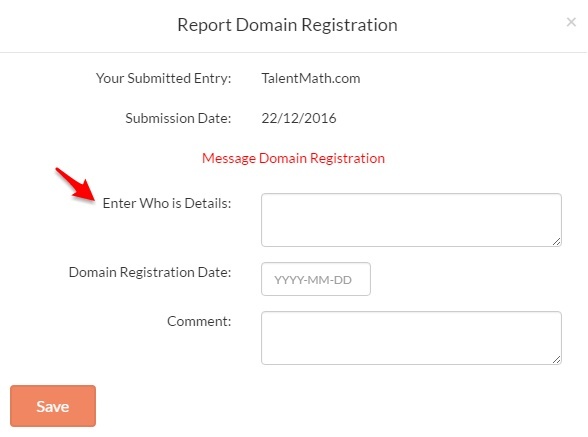 Please read our Reported Domain Registration Policy before reporting a domain. On the contest page, under the Entries tab. Click on “Check Domain Availability”, if that name is no longer available, the “Report Domain Registration” link will be visible below the name. Click on this link and a popup window will appear. Please provide the “Who Is” information for the domain name. The Who Is information must contain a name or the contact information of the person who registered the domain. Violation of our Terms and Services can result in actions such as suspension of violators account.